We know birds fly south for the winter but northern Europeans have a different migratory pattern – they drive south for the summer. Amazingly, the Mediterranean region is the world’s most popular holiday destination: it attracts some 120 million visitors from northern Europe each year, the largest international flow of tourists on the globe. The obvious thing for a Swiss-based family to do is to join the hordes of continentals on the journey south. So imagine you are driving past the city of Pisa. You’ve never seen the famous Leaning Tower. Who knows when you will have another opportunity to do so? (OK, maybe next year but that’s a whole year away). The temperature is a sweltering 35 degrees (95° F) and it’s the middle of the day. You’ve no GPS because you like to think there’s nothing wrong with old fashioned maps. On an impulse you take the Pisa exit, a random Pisa exit because without GPS or a map of Pisa, you don’t know which is the right one. After a short while driving through suburbs you spot the sign for Torre Pendente – two new Italian words that can only mean one thing! You keep driving to get as close as possible, the signs disappear from time to time but you persevere and make it to within spitting distance of the tower. You know you must be close because African hawkers are waving you into a parking space in the impossibly narrow streets of the old town. You spill out of the car and hastily cover the dazed children with lashings of sun cream. They’ve never experienced such high temperatures but are suddenly alert enough to want to buy thread bracelets from the African parking attendant. Three bracelets later, you set off on the five minute walk to the tower. 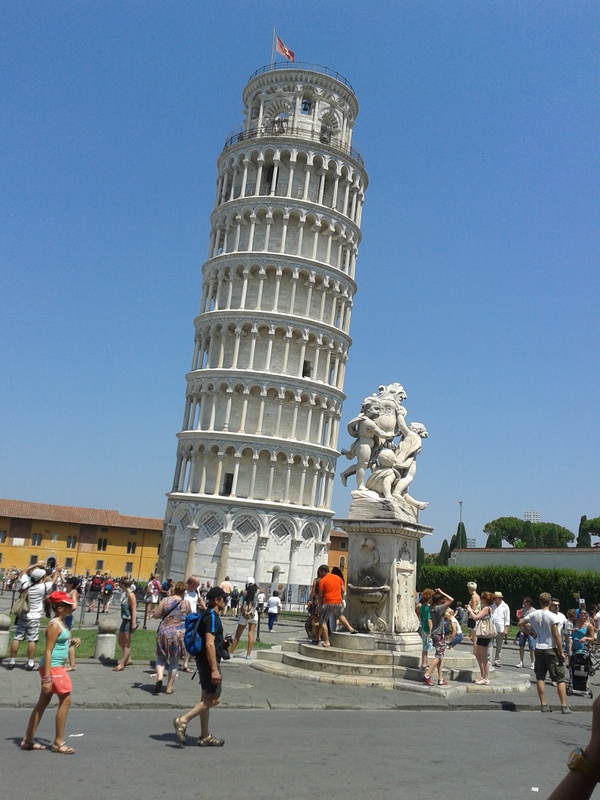 You know all about the tower, it’s old, Italian and it leans. But then you round the corner and see it for the first time and it is still a wonderful surprise. You can’t help but gasp at the sight. The 800-year-old bell tower is beautiful. Scrubbed clean, the white marble gleams like new. You have to laugh. The huge open space is filled with every nationality under the sun, taking photos of the tower. You could fill Noah’s Ark from this crowd and repopulate the world. People are stretching out their arms in an odd leaning pose. In their photos they will appear to be supporting the tower. The atmosphere is one of delight. People are hot, a little stressed but happy. You know you’re not going to forget the moment. You realise it’s one of those things that you have to see for yourself. Last week I wrote in slightly disparaging terms about the Jungfrau railway, the ultimate Swiss tourist trap. But I think I get it now. Some sightseeing trips are worth the effort. Have you been anywhere interesting this summer? Got any good tourist trap anecdotes or tips to share? Hi Clare, thanks for stopping by my blog a couple of times recently – I’ve never been to see the Leaning Tower, but maybe someday. I’m hoping to get to Hay on Wye in the next few days when I’m visiting my parents, and that is probably a big tourist trap these days, but the temptation of bookshops is just too great to be missed any longer!